Marking 100 years since the 1919 Chicago race riots, we’re part of a year-long initiative to confront the legacy of the most violent week in Chicago history. 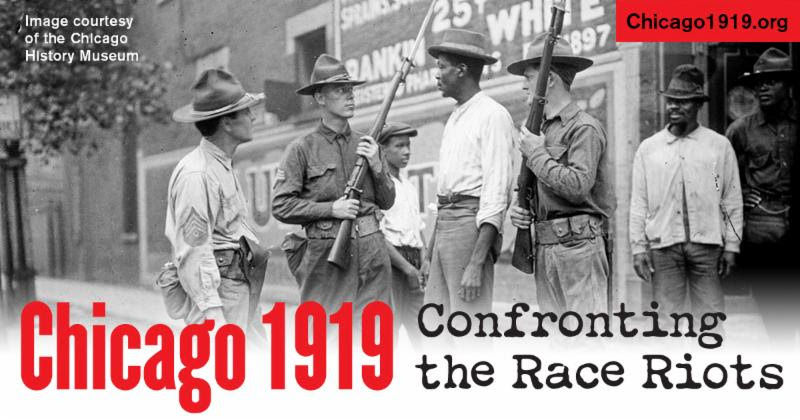 “Chicago 1919: Confronting the Race Riots” explores 100 years of racial division through panel discussions, bike tours, film screenings, poetry slams, and more. The Opening Event kicks of a year-long series of conversations on the history and legacy of the 1919 race riots. Housing and Color Lines, facilitated by Lee Bey, Architectural Critic, Photographer, and Writer. Policing and Violence, facilitated by Robin Robinson, Special Advisor for Community Affairs at the Chicago Police Department and former Chicago news anchor. Media and Race, facilitated by Chris Benson, Lawyer, Screenwriter, and Associate Professor at the Medill School of Journalism. World War I and Chicago’s Black Soldiers, facilitated by Christopher Reed, Emeritus Professor of History at Roosevelt University. An Artifact and Archival Show-and-Tell of the DuSable exhibit, Two Colored Women in the US Expeditionary Forces: The Story of Kathryn Johnson, led by Armand Gonzales, author, doctor, and teacher. Young Adult book reading in the DuSable gift shop, A Few Red Drops, with author Claire Hartfield. Video Booth: Record your own Great Migration or Family Migration Story. The afternoon will conclude with a poetry reading by acclaimed Chicago poet Eve Ewing from her new book of poems about the 1919 riots. Saturday, February 23, 2019 | 2:00pm-5:00pm | DuSable Museum of African American History | FREE Admission | Click Here to Register | Please enter the Museum through Harold Washington Wing entrance on 57th and Cottage Grove. Visit www.chicago1919.org to learn about the project and to register for free programs. Funded by the National Endowment for the Humanities, the project is being coordinated by the Newberry Library in partnership with 13 other Chicago institutions.